In August of 1999 the Washington State Legislature passed the Salmon Recovery Act in an effort to protect our salmon as an aquatic resource while still maintaining commercial forest management as an economically viable use of lands suitable for that purpose. To do this they set up new regulations to protect the riparian areas of Washington forests. These regulations directly effect and diminish the economic viability of our state's small forest landowners. Along with the new regulations passed with this act, the Legislature established within the Department of Natural Resources the Small Forest Landowner Office (SFLO) as a resource and focal point for small forest landowner concerns and policies. 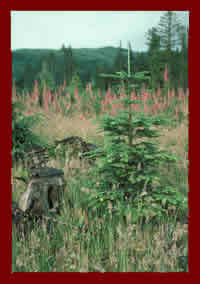 The SFLO came to RTI in March of 2001 with the task of creating a statewide database comprised of all the non-industrial small forest landowners of Washington, the forest parcels owned by these landowners, and the watershed that would be effected by the forestry activities on each parcel. The SFLO contacted the assessor's office of each county and delivered to us the raw, tabular data of the eight-teen western states. The GIS specialists of RTI went to work building a program that would work with the database by providing the watershed information of any parcel within Washington. Another team consisting of RTI staff working out of the University of Washington's College of Forest Resources facility poured over the tabular data to determine that they had the necessary information, or to contact the counties where further data was needed. On the June 30th, 2001 deadline RTI handed a working small forest landowner database for the state of Washington over to the SFLO. The database will be used by the state to better understand the effects of the Salmon Recovery Act on the landowners and the waters, and as a source to contact the landowners with regards to new forestry technologies and future easements provided by the state to compensate for lost revenues. For more information on the progress of the SFLO database project, check out the Fall 2001 RTI Newsletter, Fact Sheet #05, or open/download a PDF copy of the SFLO Database Project Summary. Determine the percentage of non-industrial landowners that were identified using county tabular parcel data and county GIS data. Analyze the differences between generating reports using tabular data verses GIS data. Determine other resources available to identify forest landowners other than information from the county tax assessor. Technologies such as Landsat, orthophotos, and land use land cover datasets will be explored. Determine if tabular data can be used to effectively generate accurate reports. Explore issues such as contiguousness, significant riparian ownership by watershed, and acreage.